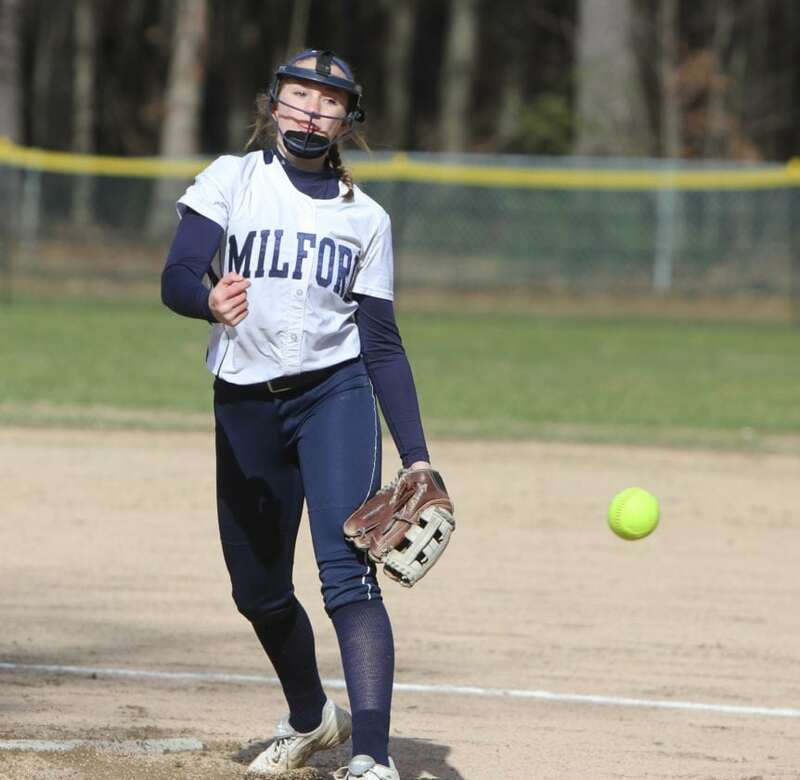 Staff photo by TOM KING Milford pitcher Jenna De'Angelis lets one go during the Spartans' 9-2 win over Souhegan during the regular season. She could face the Sabers again in a Saturday Division II quarterfinal. Now the real games begin. The high school baseball, softball, boys and girls lacrosse tournaments are set to get underway on Wednesday and Thursday, and there are locals galore in action – some against each other. 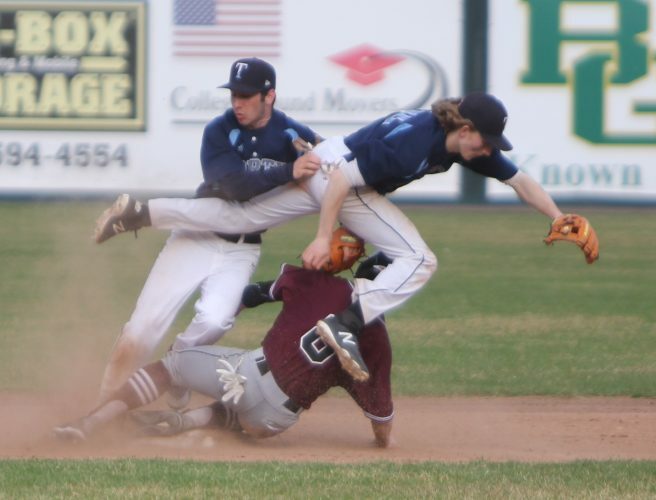 Perhaps the premier local matchup will be Thursday at Holman Stadium with Nashua North squaring off against Bishop Guertin in the Division I baseball preliminary round. 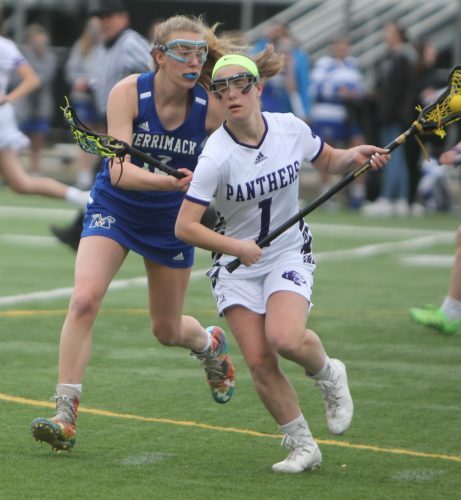 In girls lacrosse, there are two all-local games on Wednesday, as Souhegan hosts Nashua South and Bishop Guertin hosts Merrimack in the Division I quarterfinals. There are two three unbeaten local teams beginning play. In softball’s Division III, Campbell (16-0) hosts Monadnock on Wednesday in the prelims. 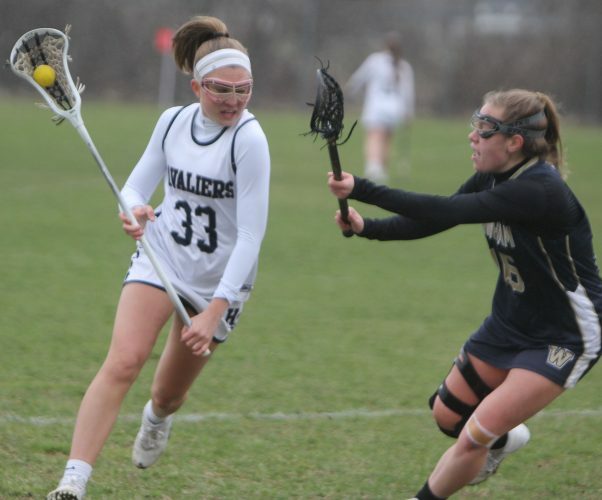 The area’s other two unbeatens, Milford softball (16-0 atop Division II) and Bishop Guertin boys lacrosse (16-0 atop Division I) won’t play until Saturday. Milford has a bye and the Division I boys tourney doesn’t begin until the weekend. Meanwhile, longtime Souhegan baseball coach Bill Dod embarks on his final tourney journey as he will retire at the conclusion of his 50th season coaching. The Sabers are at Hanover in the prelims on Thursday. All the prelims are Thursday. Besides the No. 12 North (9-11) vs. No. 5 Guertin (13-7) game at Holman Stadium (check schools for time, it could be a 4 p.m. or in prime time) the only other Division I prelim is No. 10 Nashua South (10-10) at No. 7 Dover (10-8). Besides No. 12, 7-9 Souhegan at No. 5, 11-5 Hanover in Division II, No. 11 Milford (7-9) also has a long trip, headed to Conway to face No. 6 Kennett (12-6). The defending Division III champion Campbell Cougars get a home prelim as the No. 6 seed (11-5), hosting No. 11 Newport (8-6). Keep an eye on No. 3 Wilton-Lyndeborough (14-2) in Division IV, as the Warriors host No. 14 Epping 6-10) in their prelim, and will play at home in the quarters Saturday if they win that one. OUTLOOK: It’s clear that Grant Lavigne-led Bedford (19-1) is the Division I favorite, but No. 3 Pinkerton (16-4), the only team to have beaten the Bulldogs, has opened some eyes with No.2 Exeter (17-3) a potential semifinal foe. Guertin? The Cards are tough, led by sophomore pitcher Brett Anderson. “We feel we can play with anybody,” Guertin coach Scott Painter said during the season. They beat the Titans 5-2 just a couple of weeks ago and a rematch between Anderson and North pitcher C.J. Barrett, who pitched well after a rough first inning, would be fun to see. The winner likely has to go to Concord (14-5) on Saturday, and BG beat the Tide 6-3 early in the season while North just fell 10-2 to the Tide. Meanwhile, the Panthers, who have been paced by the arm of Hunter Routhier, will have to face a Dover squad it just lost to 6-2. They would love to spoil a potential all-seacoast quarterfinal (Dover-Exeter) with a win. In Division II, the Sabers have a top player in sophmore Daniel Trzepacz who has hit everything and everyone this spring. Dod was hoping to perhaps see a team the Sabers hadn’t faced; they lost 9-1 to the Marauders on the road early this month. Milford will face a Kennett team for the first time this spring. “I would love a Milford-Souhegan state final,” Dod said the other day. It’s remotely possible, will take a series of upsets. Defending champion Portsmouth (15-1) is the division’s clear favorite. Can the Cougars, who have been led by the pitching of Keegan Mills and James Cardello this spring, repeat as champion? It won’t be easy; if they beat Newport (did not play in the regular season), they may have to hit the road (at No. 2 Belmont) for the first time in recent postseason memory. Ah, watch those Warriors in Divisin IV, led by .500 hitter Jake Levert. “Anything can happen in the playoffs,” Warriors coach Dave Finch said. “Any one of the top six or seven teams can win it.” WLC did not play Epping during the regular season, and could host No. 6 Moultonborough if it wins the first one. THE PICKS: Bedford I, Portsmouth II, Belmont III and Wilton-Lyndeborough IV. All the prelims are Wedneday. For the first time in recent memory, there’s just one Division I entry, No. 7 Alvirne (11-7) which hosts. No. 10 Timberlane (10-8) , a team they just played last week. Milford, Division II’s top seed gets a bye until Saturday’s quarterfinals while No. 9 Souhegan (11-5) is at No. 8 Coe-Brown (11-5) on Wednesday. Despite a 16-0 mark Campbell is the second seed and hosts No. 15 Monadnock (5-11) on Wednesday while No. 4 Wilton-Lyndeborough (15-3) hosts No. 13 Littleton (7-9). This is a sport that could have as many as three local state champions. In Division I, Alvirne and Timberlane just played the other day with Timberlane winning 10-9 despite Liz DeRosa’s four hits and three RBIs plus a homer and three ribbies from Alexis Charbonneau. It’s a tossup; the winner gets No. 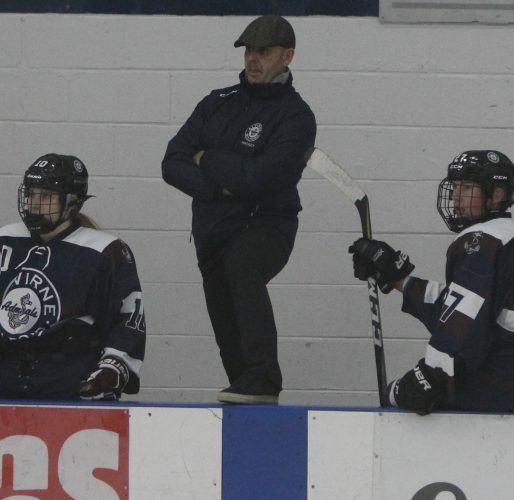 2 Winnacunnet (16-2) on Saturday, and the Broncos beat them 5-2 during the season. Don’t be surprised to see coach Sara Brisk’s team in the semis. Defending Division II Milford is simply loaded. Before the start of the season, coach Jim Rines said “I don’t ever have a rebuilding year.”, and that certainly held true. Pitcher Jenna De’Angelis has led the way (17 strikeouts in her regular season finale). They could have a quarterfinal rematch with area rival Souhegan, whom they beat 9-3 some six weeks ago. The teams played in the semis a year ago. Campbell certainly looks solid in Division III; the Cougars have hit and pitched well, Marissa Carignan getting their last win, but Olivia Byers also has pitched well. They just blanked Monadnock 7-0 with Byers in the circle. Unbeaten Newport (14-0) could loom in the semis. Wilton-Lyndeborough has been the Lexi Balam show pitching and hitting; the Warriors hope to get past the semis this year and don’t bet against them. They did not face Littleton in the regular season. THE PICKS: Winnacunnet, Milford, Campbell, Wilton-Lyndeborough. LOCALS: The quarterfinals in Division I don’t start until Saturday, with No. 1 Bishop Guertin hosting No. 8 7-10 Hanover, whom they beat in last year’s quarters and also 21-12 on April 12. No. 7 Nashua South (9-8), which has won eight of 10, has the uneviable task Saturday of going to No. 2 Pinkerton (16-2) Saturday. The only other local boys lacrosse tourney entry is in Division II, where Hollis Brookline (No. 11, 7-9) is at No. 6 Winacunnet (10-4). OUTLOOK: Look, we all know it will be the Brian Cameron-led Cardinals against the Astros in the Division I final on Saturday night, June 9 at Exeter’s Bill Ball Stadium. Remember, the last couple of years, whoever has lost the regular season matchup has won in the finals, and the Astros lost to BG 13-11 back on April 30. Kudos to the Panthers for rebounding from a tough start to finish above .500; barring a major upset, Saturday would be Fordham-bound Sean Holland’s final game as a Panther. Hollis Brookline has won three of its last four and beat Winnacunnet 6-5 on the road earlier this month. Can the Cavs do it again? Derryfield (17-0) owns this division. THE PICKS: Bishop Guertin (I), Derryfield (II) and Laconia (III). All the local tourney games in this sport are Wednesday. As we said, intriguing all-area matchups in Division I, with No. 2 Souhegan (16-2) hosting No. 7 Nashua South (8-8) and in a rematch from last year’s quarters, No. 5 Merrimack (11-5) at No. 4 Bishop Guertin (12-5) at Stellos. The only other local game is in Division II, where No. 4 Hollis Brookline (11-4) hosts No. 5 Windham (12-6. OUTLOOK: The Sabers’ only two losses are out-of-state; they have owned Division I except for having to win in overtime vs. the Cards and No. 3, 14-3 Bedford, whom they could face in the semis. It could come down to the play of goalie Alex LaBrosse in the close ones; they have plenty of scoring. Kudos to the Kirsten McIntire-led Panthers for a solid season; tough draw against a team they lost 17-2 to early in the season. Guertin, meanwhile, beat Merrimack 15-4 early this month. If they do it again, top seed Pinkerton (16-1) likely awaits in the semis. A BG-Souhegan final would be fun, though. Don’t underestimate Hollis Brookline in Division II. The Cavs have a nice rivalry with Windham and thumped the Jags 16-6 last month. If they do it again, top seed Winnacunnet (15-1), who blasted them 19-3 during the season, could be a Stellos semifinal foe on Saturday. THE PICKS: Souhegan (I), Winnacunnet (II), Derryfield III). Make sure to check with local schools for any updated tournament game times.